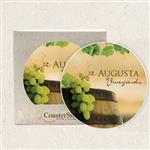 Want a Made in USA promotional coaster - here you go! 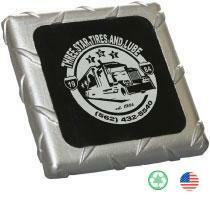 Dazzle your coffee table, desktop, and conference room with our unique diamond plate coaster. Made out of cast stone, choose your powder finish of elegant, bronze, gold or silver. 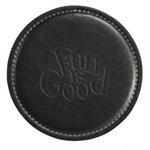 Display your logo with the classy black leather insert. 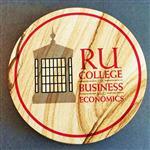 Our made in the U.S.A coaster is a great gift for executives or as a desktop promotional item. 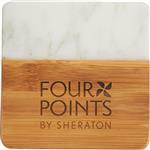 Typical Imprint Area(s): 2 1/4" x 2 1/4"